The historic Eads Bridge has spanned the Mississippi River at St. Louis since 1874 and today carries thousands of MetroLink passengers and hundreds of personal and commercial vehicles between Missouri and Illinois every day. 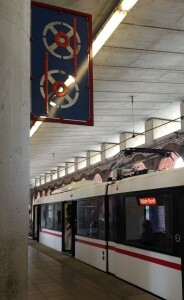 While the image of the bridge is familiar to most residents of the region, some of the elegant structural details of the bridge now have become the subjects of special 3D artwork that passengers and visitors to the Arch-Laclede’s Landing MetroLink Station can admire on large colorful panels of sculptured aluminum mounted on columns down the center of the station platform. Metro employees, local media, and Metro customers on Thursday joined John Nations, Metro President and CEO; David Allen, Director, Metro Arts in Transit Program; and artist Beliz Brother of Seattle for a special dedication. 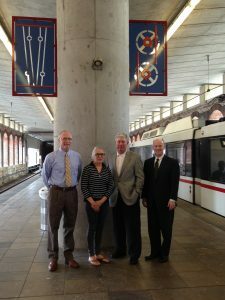 The artwork titled ‘Build’ by the internationally-recognized artist, is part of Metro’s Arts in Transit Program commitment to upgrading MetroLink stations in the original part of the light-rail alignment. After visiting the bridge twice, studying the work of designer-builder James Eads, and viewing his original drawings from the 1860s, Brother produced abstract representations of some of the structural elements designed by Eads. “Because of where this artwork is located and because I am always using different materials and methods of fabrication, the artwork for Arch-Laclede’s Landing Station is not like anything I have done before,” Brother said. “The scale is sometimes changed to be larger or smaller than the real objects, but the shapes are directly from the original drawings of the 1800s. The colors were chosen because they appear in some of the drawings and construction comments on the drawings. If people who are traveling on a MetroLink train or waiting on a platform know this, I hope that they can recognize in the artwork some of the details from the drawings that exist in the actual bridge,” Brother said. 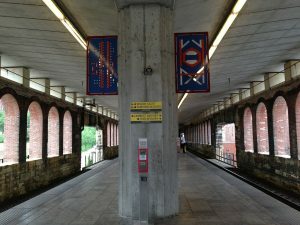 The eight panels, each 4.5 feet tall by 2.5 feet wide, are mounted in pairs on four center columns along the length of the station platform. The panels and frames were fabricated from aluminum and the designs were cut into them with water jets. The finish is baked-on, powder-coat enamel in shades of red and blue. The artwork was assembled and installed by Brother’s colleagues from her studio in Seattle, Jeremy Sharp and Dennis Mendoza. Brother has produced many pieces for public locations, including the Tech Museum of Innovation in San Jose, Seattle City Hall, Seattle Seahawks Football Stadium, Phoenix Civic Center, Swedish Medical Center, and the Akasaka Gakudo Center in Tokyo. In 2010, her artwork, bloom, was recognized by the Americans for the Arts Public Art Network as one of the best public artworks in the nation and is permanently installed at Everett Community College in Everett. Wash. Among her honors are a Western States Arts Foundation Distinguished Work in Sculpture Award, the Northwest Institute of Architecture & Urban Studies Rome Fellowship, a National Endowment for the Arts Visual Arts Grant, and the Seattle Office of Arts and Cultural Affairs Northwest Major Works Award. The artwork was financed with $50,000 from the American Recovery and Reinvestment Act (ARRA) through the Federal Transit Administration. 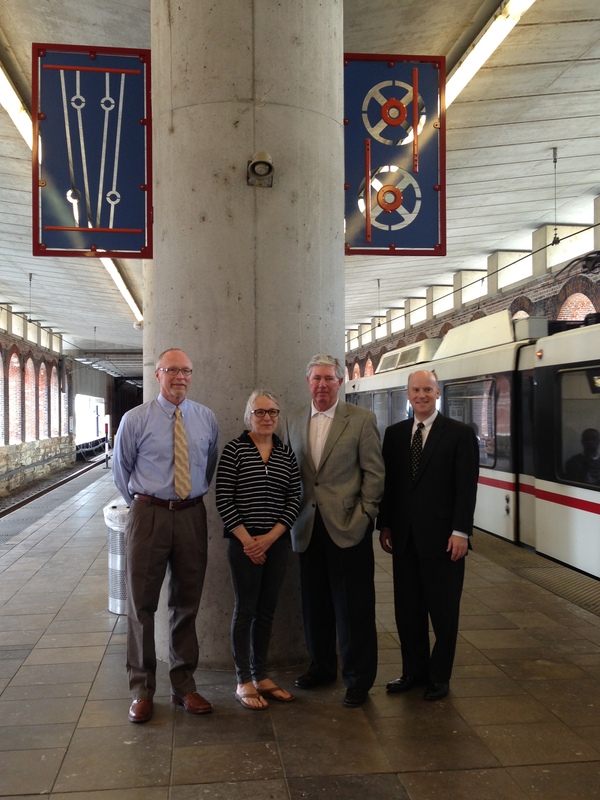 It is the third of seven projects financed by ARRA to be created and installed at stations in the MetroLink system. 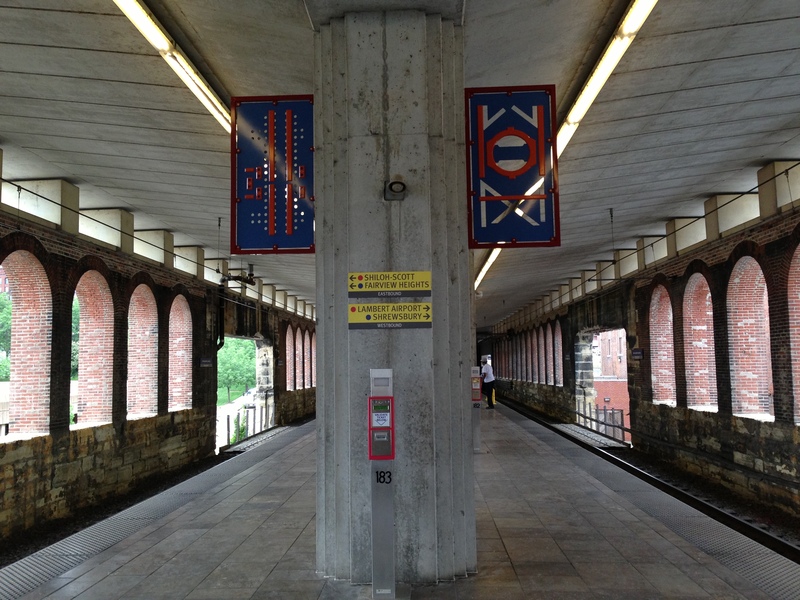 Metro Arts in Transit also plans other public art projects over the next two years.